There is no question that self-driving cars are in our collective future. They represent a transformative shift in transportation that will, in turn, drive a transformation of the world in which we live. We at Ford certainly strive to be leaders in the self-driving revolution?—?leaders known for doing it right, putting our customers’ safety first, and building a strong business that enables this technology to serve their needs. That’s why we’re pleased to be recognized by Navigant Research in its Leaderboard Report for Automated Driving, an independent research study published annually. In Navigant’s assessment of strategy and execution of automated driving systems, Ford was ranked ?1 out of 18 automotive and technology companies around the world. This is an important report because Navigant takes a holistic look at what is required to bring self-driving vehicles to market at scale, looking beyond just the hardware and software development efforts that have dominated recent headlines. While we are making significant strides in the development of our hardware, known as the Autonomous Vehicle Platform, and the software, or Virtual Driver System, and we have had a fleet of Fusion Hybrid Autonomous Development Vehicles testing on tracks and public roads around the country since 2013, there is still much work to do to bring self-driving cars to market. First, integration is key. Our hardware and software platforms need to be integrated into an efficient, high-quality vehicle system. This is a complex task. All the various electrical and mechanical systems must talk to each other. It requires development of redundant actuator controls. Energy management must be optimized, as the computing system requires significant power. The powertrain and transmission must be calibrated with the goal of maximizing fuel efficiency. And, the suspension needs to be tuned to deliver a ride experience that passengers will enjoy. Second is manufacturing capability. Building the “car” part of an autonomous car is no easy task. Take it from us, we’ve been building vehicles for 113 years. I believe that Ford has the best engineering and manufacturing employees in the world. Every day, in Ford manufacturing facilities, our employees take all the complex systems I mention above and put them together to create world-class vehicles?—?and they do this hundreds of times a day. And, by working together, our engineering and manufacturing teams are well positioned to deliver the high-quality, reliable experience that people will demand in a self-driving vehicle. With autonomous vehicles expected to see mileage more akin to today’s taxis than personal vehicles, quality will play a critical role in helping autonomous vehicles withstand the rigors of high-mileage driving. All of that is just the car part of the equation. 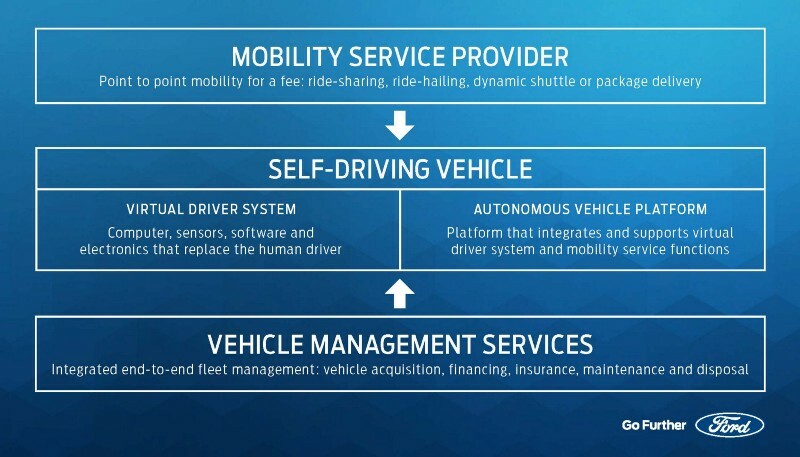 As outlined in the chart above, we see two other critical elements to bring self-driving cars to market. Our plans call for self-driving cars initially to be used in mobility services, such as ride hailing, ride sharing or package delivery fleets. To operate the vehicles in a mobility service and provide such features as the user interface and point-to-point navigation, there needs to be a service provider. Plus, somebody needs to own and maintain the vehicles. At Ford, we’ve set up Ford Smart Mobility LLC to build our mobility commercialization strategy and capabilities, including how the vehicles will be managed and operated. I’m proud of the work our team is doing to lead the self-driving revolution, and we are honored by the recognition that we’re getting along the way. That said, we do not underestimate the amount of work and innovation ahead of us, and we remain committed to delivering vehicles that will truly change the way the world moves and make transportation accessible for millions around the world.